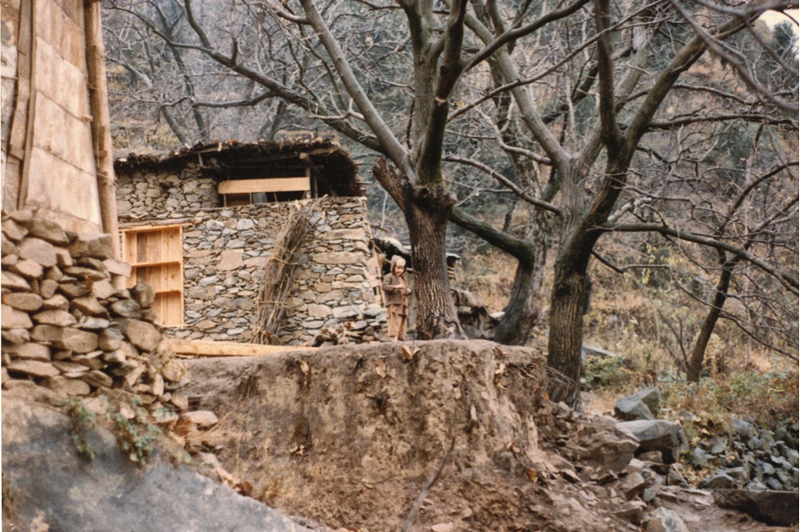 Steve Wallace is a Textile Collector living in Australia and has kindly shared his memories of a visit to the Swat Valley three decades ago through this note. Photos are at the end of the note. 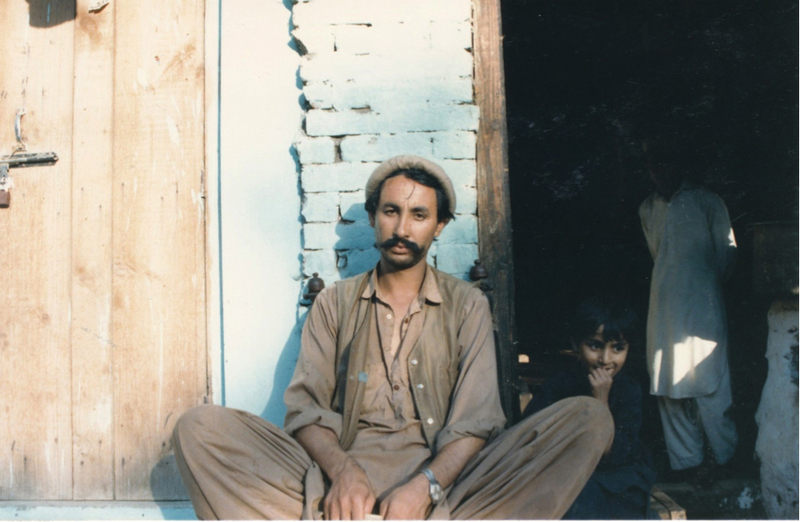 The background to all this – General Zia is in charge of Pakistan; there is talk of CIA presence and no doubt it’s true; millions of Afghan refugees in the country; the Soviet invasion is still occurring; there is a lot of heroin business – people in Peshawar assume I’m there buy heroin – I’m actually there to buy carpets! I went to Swat as it was suggested by a fellow I’d bought some carpets from in Adelaide. It was a good tip. I’m in the Muambar Khan’s upper house, a few minutes walk up from the town main street, mud floor with a small courtyard outside – rooms on 2 sides. There are geraniums, roses and little pine trees planted along the outer wall. There’s a small heating stove in the middle of the room. Charpoys to sleep on/sit on. The family has a grocery shop in town. Amin is the main host for tourists. He is friendly, and knowledgeable. Up here, you can hear distant sounds from downhill – dogs barking, kids playing, motor vehicles. Closer sounds – more dogs whining and scratching at the doors (there are 9 puppies here), music from the room nearby of our major host (Amin MK, the younger or youngest brother), quiet conversations between the MK brothers and the father. Snow has fallen and the more distant (taller) hills are dusted with clean white, mixed with green/grey of frosty pines. You can look over the town from outside the courtyard, and see the hills, more distant snow-capped mountains; the hills are terraced as high as possible, rocky in parts and covered in short grasses. More houses across the valley – at night there are little strings of lights below and across the valley. This was part of the barber shop – the barber was doing soapy shaves with a cut-throat razor. The baths (4 booths) were behind wooden doors and with wooden seats, with two 44 gallon drums slowly filling with water and warmed by fires beneath them. Two boys working, looking after fires and the water flow. There’s one main street lined with little shops, restaurants, tea houses. 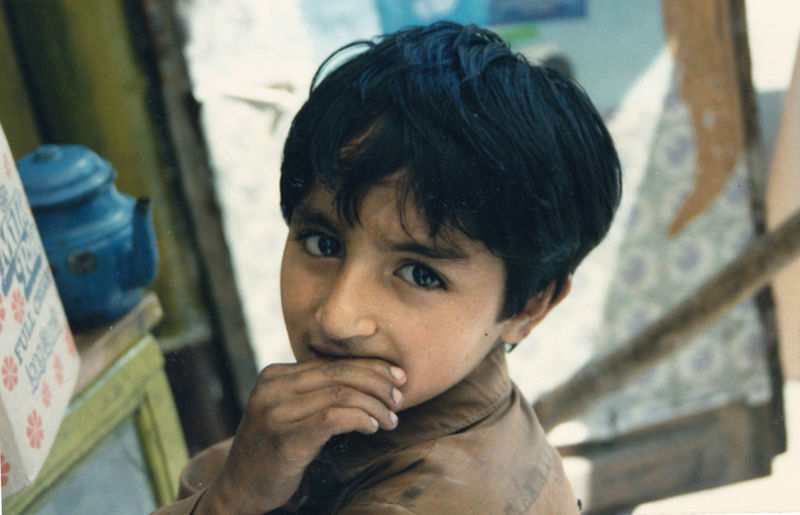 You hardly see a woman in the street – men in blanket like shawls with golden caps or Pathan woollen hats. It’s my birthday and Muhammed’s as well. Consequently, it’s a public holiday (due to Muhammed, not me), and so the bank is not open to change some traveller’s cheques. The man in the tourist office advised us to go to the Swat tourist shop, where the owner happily changed money on confirming I was Australian and therefore trustworthy (!). I believe now his shop was replete with phulkaris and related textile works of art, but very sadly, I was unaware of this aspect of eastern work and so bought nothing. The Pakistan Tourist Development hotel (where ‘luxury’ buses depart for Peshawar) serves coffee and has a huge dining area with many large Afghan (Turkmen style) carpets adorning the floor. This is one of the fine meals. The stall has a huge (maybe 1 metre diameter) frying pan on a slope so that the lowest area is getting the main heat from the fire. Again the stove is high so I’m looking up at the cook who is squatting next to the pan with a long-handled kebab moving tool. Each kebab amount is weighed, and then slapped down in the pan and moved to the hot area to seal, then moved away to cook a little more slowly. You get one and half naans with each kebab – naans are delivered in a cloth from the naan baker several shops away. Some customers reject the bit of naan (?too thin/small/burned – I don’t know) – so they get another bit and the reject goes back in the pile for the next customer. Amin is now married (I never meet his wife) and has been set up with his own grocery shop. I recall seeing in the other family shop a sack of sugar labelled (something like) ‘United Nations – for Refugees – not to be sold’. I express (then and now) no condemnation. There are two textile shops in town that I found. I bought some pillowcases, Kohistani purses, and Swat shawl. There was a European at the more replete shop, talking about arranging to film a minibus on the next day picking up a load of textiles/carpets. The morning starts with tea and paratha. Tea is from the shop across the road. The paratha man has a little set up with a kerosene stove, a frypan with a hook high above and a seat for the cook. Parathas are tossed into the oil, cooked and then hung on the hook so excess oil drops back into the pan – a brilliant one-man, movable set up. I suppose he sets up at a few spots along the road through town over the morning. 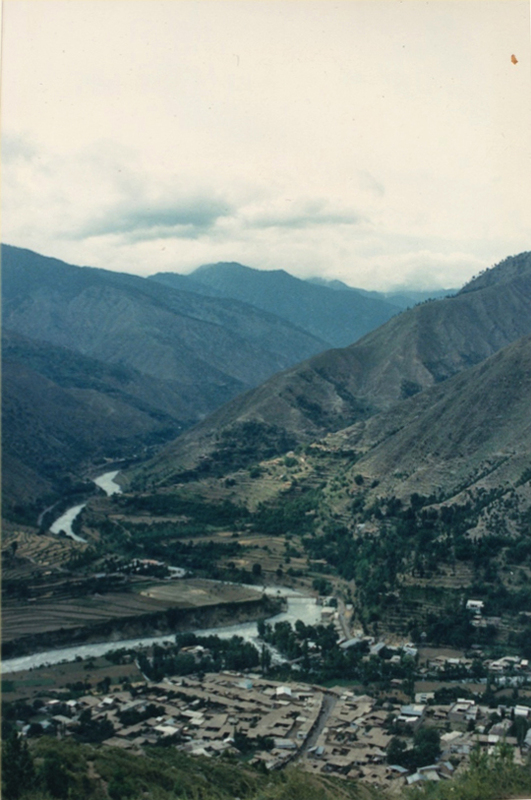 Then I head off to walk up the road to Bahrain (about 10 kilometres – I’m in ‘training’ for trekking in Ladakh). Snow-topped mountains emerge as I head up the road; the river is rough and rocky, water surging up and down in troughs and smacks of spray, and it’s grey from melting snow. Road workers and children abound, many ‘Salaam Alaikums’ and ‘Hellos’. Farmers are ploughing their little terraced plots with buffalo. Nomads (I believe) maybe Gujars (??) setting up a cup of tea just off the road. Bahrain is stretched along the road and cut by a stream like Madyan – the stream hurtles down and joins the main river by a great slab of grey rock. An Afghan has a shop here with ikats, Uzbek embroidery (segushas), Turkmen coats and carpets. He has some men out the back sewing up patchwork hangings from old ikats and other bits and pieces, and making tea. I had some green tea and bought two segushas. Then I hopped on to the roof of minibus to Kalm – a very scenic and slightly scary ride when the road was very close to the river. A slow trip due to road repair, streams, and muddy slopes. At one time we had to get off/out of the minibus and help push it up a muddy hill. Amazing sight of a huge boulder sitting out from the hillside slope on a pillar of gravel. There are waterfalls and (I think) glaciers up higher. There are goats, donkeys and cows. The hills are steeper with less cultivation and plenty of forest about. 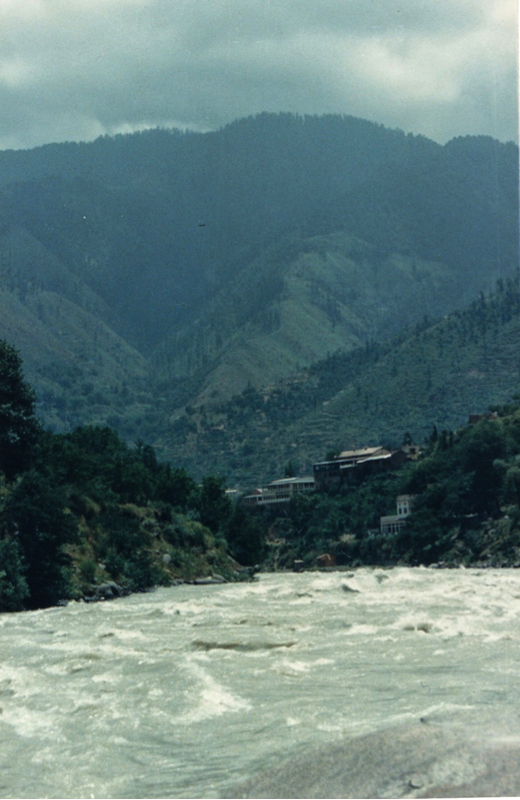 Kalam is spread out on the stones and gravel left by the river. It is at the foot of the valley with tall steep hills behind the town from the initial view I took when I climbed the (small) hill behind the minibus stand. Pakistani tourists sit on charpoys over the river, enjoying the cool wind and fruit and drinks. I cross the river to the township and went to have some chapli kebab in a restaurant. The men up here look a bit wilder – old men with long hennaed beards and a few guys with rifles and custom-decorated automatics (AK47s I suppose). As I return to Madyan, from the minibus I see the same nomads (Gujars?) some kilometres closer to Kalam; they’re driving their cows and goats along the road. 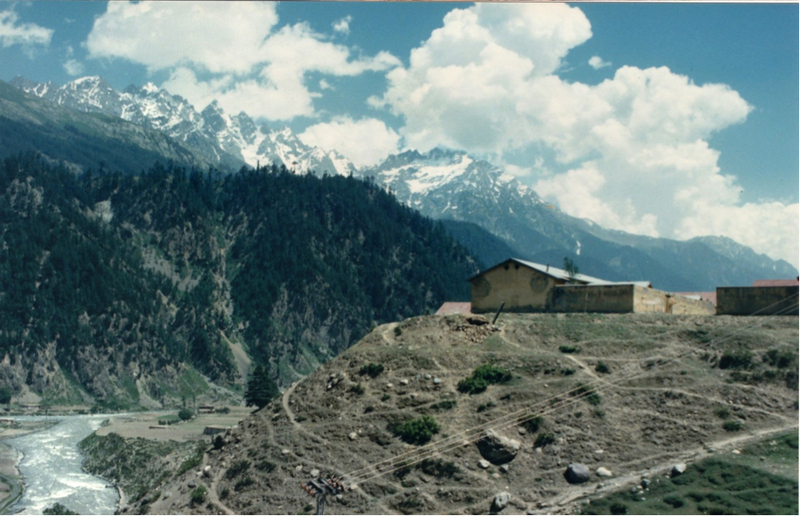 At some stage I recall Amin telling me that if you wanted to trek up near Kalam, you should have a (armed) guard, due to kidnapping and general tribal (what we would call) lawlessness. Thank you Steve for letting us live this experience vicariously! 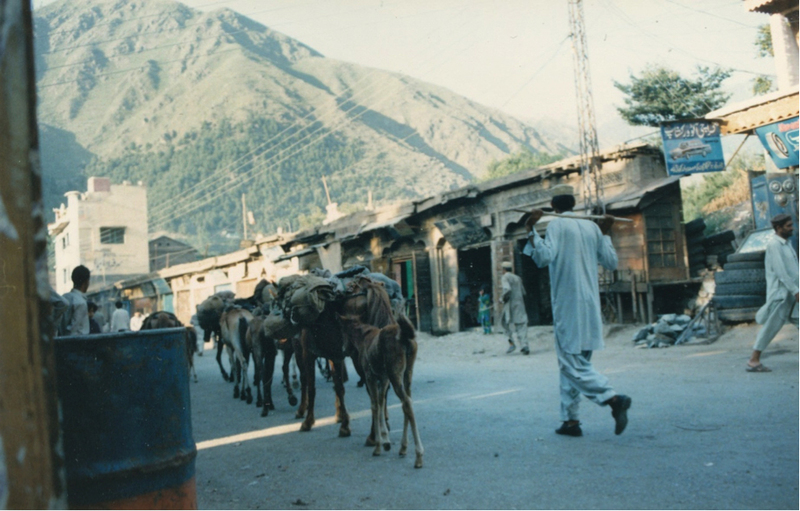 This entry was posted on June 26, 2015 by wovensouls in Culture Kaleidoscope and tagged collector, Kohistan, photo, rural travel, Steve Wallace, Swat, Swat valley, travel, travel story, traveler, travelogue.